LEADING IN: The Panthers and the Eagles were once again at the top of the AA North standings by the time the Rivalry Game came around. Though tonight’s game did not have the hype of the previous year’s Battle of the Unbeatens, there was still plenty on the line. Flag High sat a 5-2-1 and were led on offense by a pair of juniors. Quarterback Bert Gough orchestrated the offense, passing to his favorite target, Brian Zanzucchi. Tailback David Winsley, however, was the player everyone came to see. Ever since his days playing youth football, Winsley was the center of attention in Flagstaff. Short but very strong and fast, he was just as likely to run over opponents as he was to juke them out of their cleats. He played varsity as a sophomore but didn’t get a carry in the Rivalry Game; this year, as a junior, every defense in Arizona was on notice. He rushed for 1,428 yards on 169 carries in the first eight games for an impressive 8.5 average. The Panthers (5-3) also had a junior at the helm on offense. Dave Davison continued the passing tradition the Coconino faithful enjoyed the last several years, distributing the ball to senior receivers Pete Pulido and Levi Broyles. Both defenses were among the best in AA. Flag High gave up just 80 points all season, but Coconino had only given up an astonishing 52 in eight games. This may have been the Panthers’ strength, and they were going to need it if they were going to shut down Winsley. Plenty was at stake in tonight’s showdown. The winner would not only win the AA North, they would also be at home for next week’s first round playoff match up against Kingman. The loser would be traveling to Lake Havasu City to take on the AA West champ Knights. If there were a favorite in this game, the Eagles, the three-time defending state champion, would be slightly favored; then again, what did that matter in this rivalry? THE GAME: The Panthers’ offense simply could never get on track tonight, nor could their defense stop Winsley. The Flag High star ran the ball 33 times for 175 yards and two touchdowns, the first coming on a five yard blast with 9:45 left in the second quarter. Though Coconino were stymied throughout the day, their defense kept them in the game in the first half, trailing only 7-3 at halftime, thanks to Allen Meacham’s 48 yard field goal (at the time a school record and still the longest field goal by either team in the rivalry’s history). The second half was a matter of ball control for the Eagles and a lot of Winsley, who tacked on his second short touchdown run of the night in the third quarter. Gough’s 16-yard scoring strike to Brian Zanzucchi and the ensuing extra point put Flag High up 21-3 in the fourth. All told, the Eagles dominated the Panthers on both sides of the ball, rushing for 251 yards and controlling time of possession (they held the ball 31 of the 48 minutes of play). They outgained the Panthers in total offense, 313 yards to 87. Davison completed seven of seventeen passes for 45 yards and threw one interception; between his ineffectiveness and the Panthers’ inability to run the ball (42 rushing yards), Coconino simply did not get a lot of chances to score. AT THE END OF THE DAY: The Panthers went on the road and beat Lake Havasu, 17-7, but their title hopes were dashed the next week as they lost to Peoria, 27-7. They finished the regular season 5-4, and with the playoffs, 6-5. Flag High cruised through their first round game against Kingman (31-7), then held on to beat Gilbert in the semis (17-9). The Eagles faced the Peoria Panthers in the state final at Glendale High School. 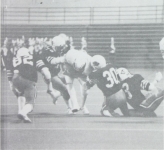 Winsley rushed for 119 yards on 20 carries in the title game but never got in the end zone; it was a gadget play that put the Eagles on the board in the second quarter, a pitch from Gough to halfback Ty Van Dyke, who then hurled a 48-yard pass to Zanzucchi. A late drive brought Peoria to the Flag High 10 with 1:18 left in the game, but on third-and-nine, senior DB Kevin Gould intercepted an intended screen pass and returned it to midfield, where the Eagles ran out the clock. Flag High won, 7-0, winning their unprecedented fourth consecutive Class AA state championship. David Winsley finished the season with 2,187 yards rushing in 12 games, eclipsing the school record held by Stan Gill, who rushed for 2,110 yards in 13 games in 1981. Rick Smith concluded his tenure as head coach after this title, losing only seven games in five years. The point must be made that neither the Eagles nor the Panthers have gone beyond the second round of the playoffs since Smith’s departure, and while other reasons apply (including the Flagstaff teams leaving Class AA after this year and moving up to AAA Skyline and later the 4A Grand Canyon Region), it must be asked, how did Smith do what no one has been able to do since?